Whether you're catching some top-rated entertainment at The Egg, exploring the city's great history, or strolling around the Empire State Plaza, there is a lot to enjoy in Albany, NY. It only makes sense that the city boasts a vibrant food scene to pair with all of the unique and cultural attractions. Whatever you're hungry for, you're bound to find it within the city limits because there is certainly a little something for everyone. From fine dining to casual to family-friendly, it takes a lot of supplies to feed the masses. We understand it takes a lot of time, effort, and work to run a successful foodservice business, which is why we have dedicated ourselves to being the top provider of Albany restaurant supplies. We know what it takes to achieve your goals, and we're here to help every step of the way. Whether you're looking for fast shipping on commercial kitchen equipment or the best prices on bulk dinnerware, you're going to find it at ShopAtDean.com. We have thousands of items in stock and waiting to be shipped right to your door. With our warehouse located in Cleveland, we are able to provide consistently fast, reliable shipping to Albany, New York - in most cases it only takes a few days. You can confidently stock up on professional cleaning supplies, restaurant flatware, bar glassware, disposable takeout containers, bakery supplies and much more without breaking the bank. We give you the ultimate flexibility (that many of our competitors do not) by offering many of our products for purchase by the each or in case quantities. This way, you only have to buy what you need and what fits into your budget. We also offer a complete line of commercial kitchen equipment. Whether you are looking to start from square or just need a few pieces to refresh old equipment, we have a wide selection of top brands at rock bottom prices. From charbroilers to chef bases, prep tables, ranges, planetary mixers, to cheese melters and so much more, you can get all the items you need in one place. Plus, our knowledgeable and friendly staff is standing by six days a week to assist you throughout the entire journey. 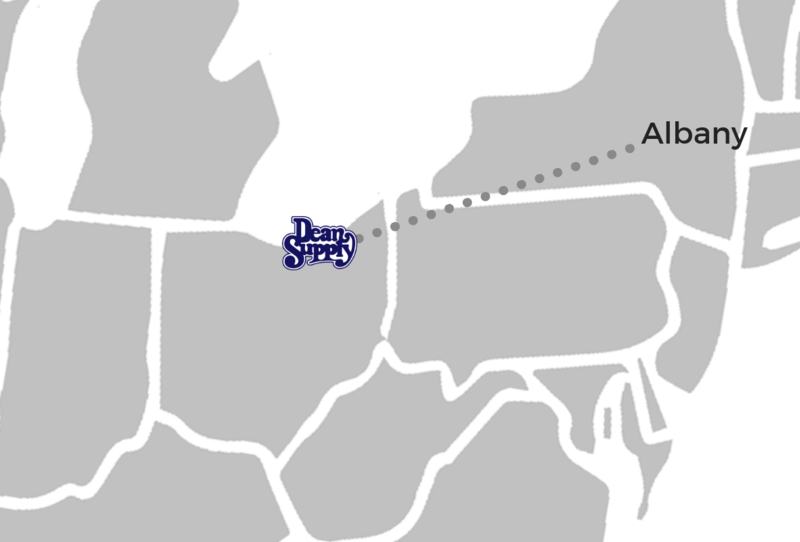 We're committed to providing the optimal shopping experience for every guest so come see for yourself why Dean Supply is the premier provider of Albany restaurant supplies! Want to see the latest trends in restaurant equipment and design? The Dean Supply Reference Guide is the only tool you need to learn more about what's new in the industry and how you can utilize it to achieve all of your goals. It will give you the inspiration you need to help set yourself apart from your competition and win those customers over time and time again.